Derbyshire Sheep have a clean cut black and white marked face and legs clear of wool. They are polled in both sexes. 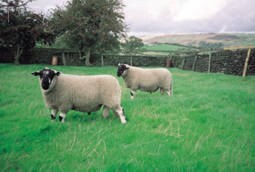 The Derbyshire Gritstone is a handsome sheep of aristocratic lineage, big, flat bones, strong and alert.